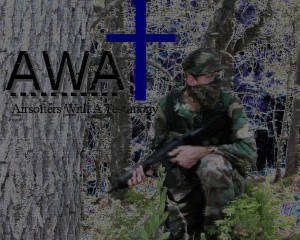 This page is a list of our team roster and our team rules if you wish to be apart of AWAT. Here is a list of the Rules of our team that will be enforced at every meeting or game AWAT attends. Rule 1: Be a good sport and not a sore loser. Rule 3: Do not try to cheat by saying the bb bounced and hit you. Rule 5: Treat the opposing team as you would have them treat you with the same respect and sportsmanship you would expect. Rule 6: No profanity or upscene picutres at events or anything that has to do with AWAT events. 1.Bdu's preffered, but whatever you desire. 5.Some sort of eye or full face protection. 6.Exrta Magazines, ammo, batteries, and gas if needed. 7.Some sort of radio to keep in contact with the team. 8.A tactical vest or or any add on gear to hold equipment. 9.Any addiontal gear need for long event such as weekend events will be adressed on the forums with games that will be set up.